On May 4th, 2017, Boston business and community leaders came together at the buildOn Boston Dinner to celebrate buildOn’s work to break the cycle of poverty, illiteracy and low expectations through service and education in Boston and across the globe. 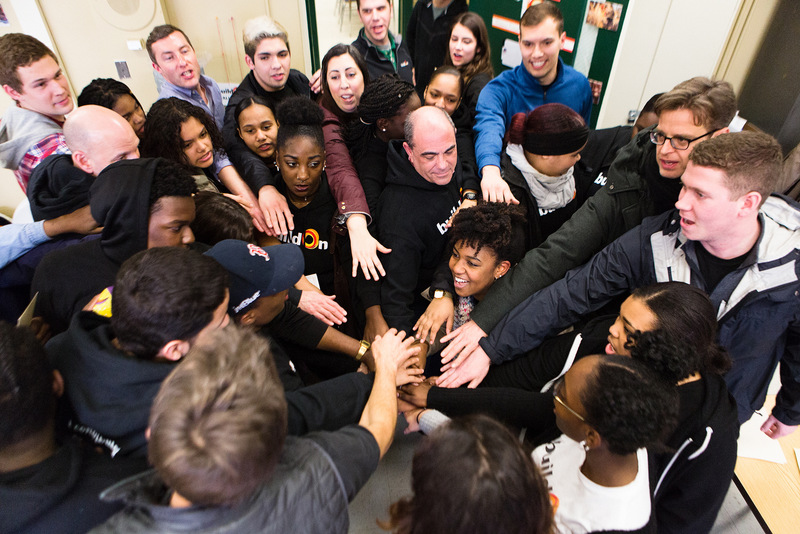 GE Chief Financial Officer Jeff Bornstein shared this personal account of his experience serving with buildOn Boston students and why he has challenged the organization to become immersed in the buildOn mission. Good evening and thank you for being here. (buildOn Founder & CEO) Jim (Ziolkowski) walked you through the buildOn story — why it is unique in its approach and the impact it is having on kids in the toughest neighborhoods in America, as well as, the poorest countries in the world. I want to spend a few minutes talking about buildOn from another perspective… that is… why GE has been committed to the organization from its inception 26 years ago. First and foremost, buildOn has delivered amazing results. One of the questions we often ask ourselves is: “Can one person or one organization change the world?” I believe the following outcomes begin to answer that question. Currently, kids from U.S. inner city schools graduate at a rate of less than 60 percent. buildOn kids graduate high school 97 percent of the time. Incredibly, 87 percent of those kids go on to college. buildOn students have contributed more than 2 million hours of service in their communities, touching the lives of 1 million people including kids, immigrants, the elderly, the homeless, victims of abuse and the mentally disabled — almost all of which live at or below the poverty line. 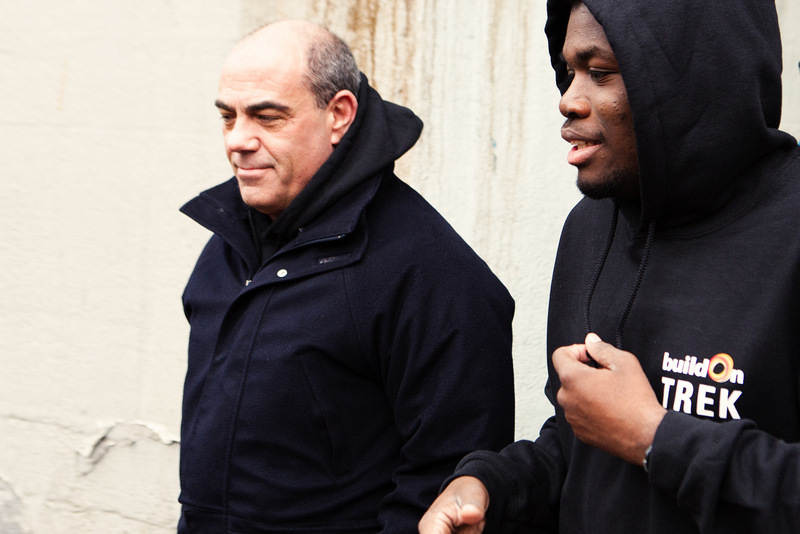 GE CFO Jeff Bornstein listens as a buildOn students lead a tour of their Boston neighborhood during GE’s recent 36 Hours immersion with buildon. The communities and people that buildOn supports find tremendous value in the interactions they have with these students but here is the real magic — the buildOn kids get an even greater benefit. They learn that they matter, that somebody cares, that their choices and actions have impact on more than just themselves, that they have purpose and value. They learn that selflessness – caring about another human being without an expectation of reward — can change their lives forever. In addition to service, buildOn students and volunteers including employees of our corporate partners have built more than 1,100 schools in the world’s poorest countries. Two million children, parents and grandparents have attended these schools. In many villages, buildOn schools are literally the only educational opportunity available. These schools address critical needs in developing countries like literacy and they provide an opportunity for young girls and women to get an education. Here is an incredible stat — 50% of the attendees of these schools are female. ‘Can one person change the world?’ Absolutely… that’s the magic of a movement… that’s the magic of a force multiplier. It starts small… it starts with one person, making one effort, to change one life and then it grows. As you may know, GE is a results driven culture and we are incredibly impressed by these results. That is why the GE team and I have remained committed to the organization for 26 years. About ten years ago I began changing how I thought about our relationship with buildOn. At GE we have a number of highly regarded training programs from finance to engineering, HR and IT. In finance, we have a program called the Financial Management Program or FMP. A 100 year old program. It is a global, two-year program with about 500 participants. Local service is part of what the FMPs plan and do but there wasn’t any continuity or lasting impact to their service projects. In addition, I started to realize that millennials were looking for more. They didn’t just want to be a part of a development program or a company making great products for the world, they wanted more. They were looking for a way to give back… to be part of something bigger than just GE or themselves. So, I challenged them to focus their efforts on buildOn – to participate in local school programs and to raise money to build a school in West Africa or Haiti. They did build a school and the whole experience has exploded from there. GE employees and buildOn students join together for a cheer of ‘WE ARE BUILDON!’ before service during GE’s recent 36 Hours immersion with buildon. GE teams across the Company have traveled to some of the most remote places on earth and have built 30 schools, in addition to immersing themselves in urban programs in Boston, Bridgeport, the Bronx and Oakland. What started as a dozen FMPs taking on the challenge to do a trek and build a school has now blossomed to all nine GE businesses across the globe. The sense of community amongst those that have participated is amazing. I honestly believe all those involved, particularly the millennials, view our Company very differently as a result. They believe that GE stands for more than just great technology, revenues and profit. Recently, a number of GE leaders, including myself, did a 36 Hour immersion at CASH high school in Dorchester. It was simply awesome. A dozen of us were partnered with a buildOn student and spent two days doing service work, getting to know the kids and their environment. Many were immigrants, some were formerly or currently in gangs and virtually all of them had challenges at home. To hear them articulate how their buildOn experience has changed their perspective, aspirations and sense of worth was amazing. The reason I am such a fan of the Corporate Partnerships, the Treks and the 36 Hour immersion programs is they create a force multiplier. If just three or four of the dozen people that participated in the CASH high school experience catch the bug, continue to participate and spread the message — that’s a huge win… that matters because eventually they will bring three or four more people to the buildOn movement, and so on. This is how you change the world… one person at a time. My partner at CASH high school was an amazing young man with enormous energy named Christian that you will meet in a few minutes. Every buildOn student is totally unique and Christian has his own challenging story. I think he would agree with me if I say he was a little bit lost and needed some direction. When I asked Christian about the significance of his tattoos he really opened up in a raw and honest way. In two days, I learned so much from him and about him — I learned that sometimes these kids’ lives are defined by the blocks they live on and not the possibility the whole world offers. It’s hard to dream about the art of the possible without a sense opportunity or role models. 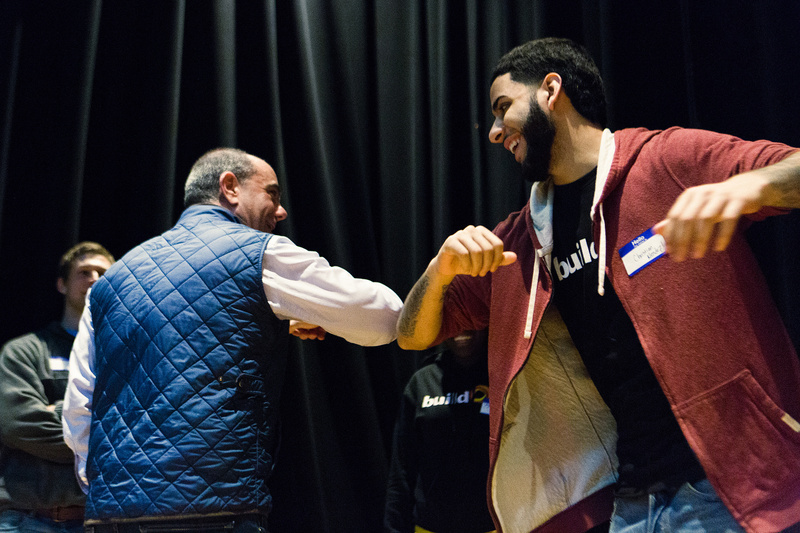 GE CFO Jeff Bornstein and buildOn Boston student Christian Mendez work on a ‘secret handshake’ during GE’s recent 36 Hours immersion with buildon. Christian has been instrumental in recruiting kids to the CASH buildOn program. During the immersion program at CASH, one of Christian’s friends shared his story with us and although he admitted to still having one foot inside his neighborhood gang, told us that but for Christian and buildOn he would be dead or in jail today. That is how you change the world… one person at a time. It is also the power of the force multiplier. I would like to publicly thank Christian for his courage and his dedication to buildOn. I look forward to watching you continue to grow. Before I invite Christian up, I just want to close with a thought. Although we are happy to accept your donations to build more programs in Boston like the CASH program or to build a school in Nepal or Malawi, what is immensely more powerful is for you and your organizations to get involved. Being involved more than just financially will change the direction of thousands of lives. More than that… I assure you that if you take a team to West Africa for a week to build a school, it will change your life and that of your team’s. If you get involved with a local program like Christian’s… it will change your life and that of your teams. “Can one person change the world?” Absolutely… that’s the magic of a movement… that’s the magic of a force multiplier. It starts small… it starts with one person, making one effort, to change one life and then it grows. 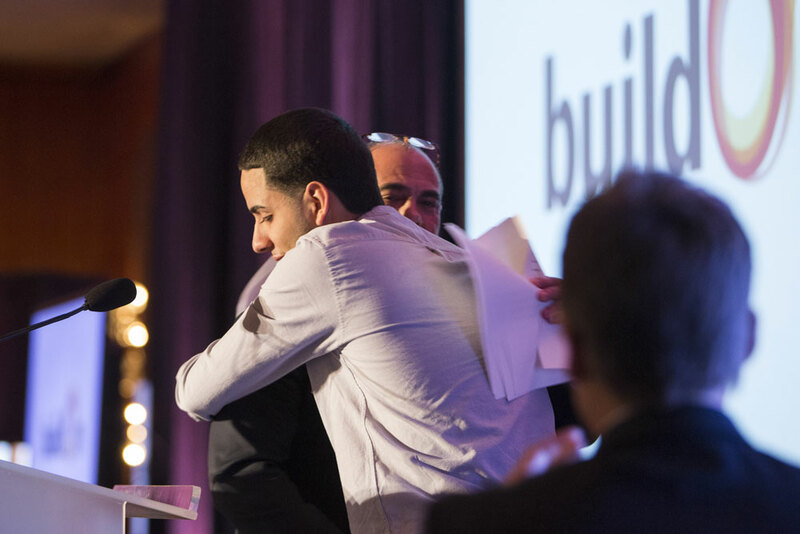 (At Top) GE Chief Financial Officer Jeff Bornstein speaking at the buildOn Boston Dinner | (Below) buildOn student Christian Mendez and GE CFO Jeff Bornstein share an emotional moment following Christian’s speech at the Boston Dinner.